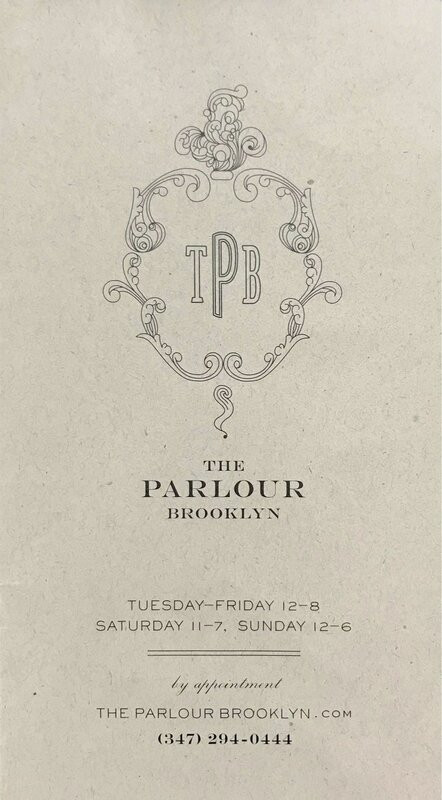 Nackie Karcher's highly anticipated salon, Parlour recently opened in the emerging waterfront section of Greenpoint, Brooklyn. An airy, intimately lit space that could best be described as Earth Deco, it is accentuated with salvaged heirlooms and curiosities from days gone by. The building, erected in 1928, has been artfully re-conceived with hand-painted walls, sweeping 9-foot brass framed mirrors, vintage chrome hairdryers and sumptuous leather captain chairs. The lavishly restored fireplace evokes a bohemian, Parisian dwelling from the twenties. It is apparent as soon as you step through the custom-made gates, build by blacksmith artist, Dan King, that Nackie and her talented team of artists and designers have spared no details. A chic marble coffee bar crafted exclusively fro the salon by Mark Diaz of MAD Design, offers clients refreshments and pick-me-ups upon check-in. A colorful collection of graphic print Mara Hoffman robes await in the powder room while vintage trunks stacked with a smart selection of magazines and periodicals complete the salon experience. As clients wait for their color of curls to set, an outdoor urban garden in the back is as inviting as it is relaxing.